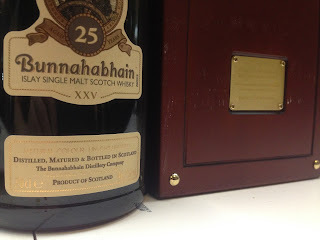 I’m back today with two more Bunnahabhain’s. I’m not ashamed to say it’s not my favourite distillery really, there tends to be a harsh oiliness that just doesn’t sing in tune. So why did I go seek it out at the whisky show? Well, because I want to be proved wrong. I really loved the 12yo actually, but not the 18yo. What is great is that older expressions are relatively available in official or independent variants. So, these two are older ones, 25 years plus actually. Nose: Sweet, Sherry maturation is apparent from the off. Syrupy Sherry, like PX, slight pepper spice, sea salt fudge. Taste: Very sweet Sherry, complex spices, it is lovely actually. Builds with time in the mouth. Finish: Medium/Long length. Lots of Sherry with peppery spice. Colour me impressed, this takes the flavours of the 12yo and amps them up with complexity and balance. Same greatness as Glengoyne 25 and Glenfarclas 25, same mark. Now an indie bottling to compare against. 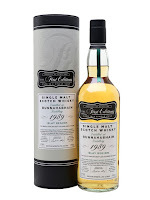 This one is a 26 year old newish one from Hunter Laing for their First Editions range. The Laphroaig was brilliant, so I hoped this would follow the same path. Nose: Oh, a natural fruity one. Very tropical fruit based with pineapple and sea salt. Taste: Again, more of the same. Salty pineapple, tropical. I didn’t spend much time with this but managed to scribble some notes. This lacked the oiliness or the peppery-ness that I have come to expect from Bunna, but it detracted from the experience. Paled in comparison to the 25OB really. Thanks for reading! More to come of course.